Skill level: medium – there are quite a few processes so this is best attempted at the weekend when you have more time available. * I know pearls of mastic sound like something you’d weatherproof your shed roof with…or possibly the magical object of a sword ‘n’ sorcery quest, however, they are in fact little crystals of natural resin from the Chia tree, grown only on the Aegean Island of Chios in Greece. Gum mastic crystals have delicate pine-resin and balsamic aromas, and are used in both sweet and savoury cooking. The crystals are also famous for their health benefits, thought to freshen breath, and have antioxidant, anti-inflammatory, and antibacterial properties, etc, etc, etc. If you live in Brighton you can buy them from ‘Tropical 4 You‘ near the Open Market on the London Road. 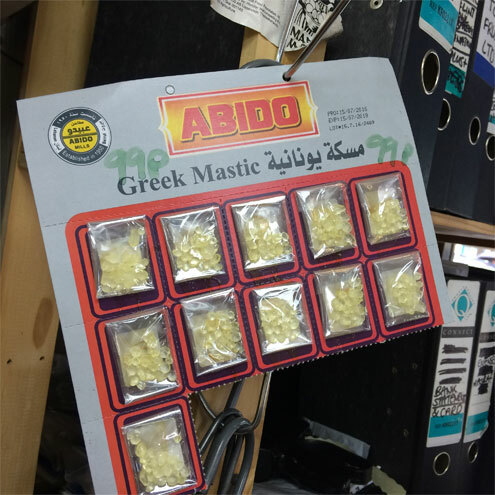 Despite sounding so exotic, pearls of mastic are disappointingly cheap at 99p for a packet of 24. If you struggle to find in your hometown, city, country, they can be bought online here. If you haven’t already, clean and prepare your squid and cut into thin rings. 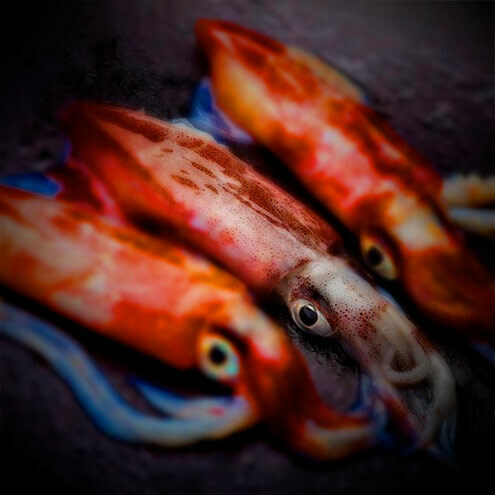 In a dry frying pan (no oil) over a high heat, fry the squid until it releases its liquid. Pour off the liquid and set the squid to one side. Dry the same frying pan, add a good glug of olive oil and place over a medium heat. Add the sliced onions and a generous pinch of salt and sauté slowly for about 20 minutes until the onions are golden and well caramelised. Keep an eye on them and stir frequently. A lot of the flavour of this dish comes from the onions, so make sure you spend the time to get them lovely and caramelised. Remove half the onions and set aside. To the remaining half, add the cumin, garlic and chilli and sauté for a couple of minutes. Then add the squid and lemon juice and over a highish heat cook until the lemon juice has evaporated and the squid has taken on a little colour. Set aside. In a heavy-bottomed pot, heat a generous splash of olive oil and then add half the rice. Stir continuously for 5–10 minutes until the rice has browned visibly. To this toasted rice, add the other half of the rice along with the rest of the caramelised onions and mix well. Pour in 375ml of water. Add a pinch of salt, a good twist of black pepper and, if you have managed to find it, 2 crushed pearls of mastic. Bring to a boil, turn down the heat to a low simmer and cook until the rice is al dente. Then add half the calamari mixture, stir to combine, turn off the heat and set aside for a few minutes to rest the rice. Take this opportunity to reheat the remaining calamari mixture. Divide the rice between two warmed bowls and top with the calamari, a sprinkling of chopped parsley and a slice or two of lemon. We ate ours with a side salad. Verdict: A tasty cross between risotto and paella. Less creamy than a risotto. Less extravagant than a paella. The roasting of the rice gives it a nuttiness and the caramelisation of the onions a complementary sweetness. There was another subtle flavour in the background which I assume to be the mystical pearls of mastic. If you are not keen on squid and didn’t vote Brexit, you could always replace with prawns. Other ways to enhance your squid could be ‘Searing with a Roasted Pepper Sauce‘ or gently ‘Stuffing with prawns‘. Drink: A couple at The Basketmakers before and a chilled bottle of Aldi’s finest during. Incidentally, when did a pint of tap lager outside London cross the £5.00 threshold? And this a day after I unwittingly spent £6.20 on a pint of ‘craft’ beer. Entertainment: Revisiting the first series of ‘Stewert Lee’s Comedy Vehicle’. Hi Linda, and it’s good to be back … thanks for being so patient. I didn’t for a moment suspect you (or any of our other lovely readers) of voting Brexit. The whole anti-Europe thing is so depressing.